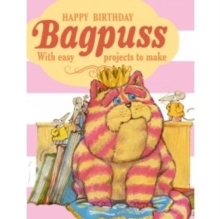 Bagpuss is 40! Emily, Gabriel the Toad, Madeleine, Professor Yaffle and the mice are throwing him a party. First Emily sings her special song to wake him up... Bagpuss, dear Bagpuss, old fat furry catpussWake up and look at this thing that I bring. Wake up, be bright! Be golden and light!Bagpuss, oh hear what I sing!...and at once the saggy old cloth cat is wide awake and full of life and the party is ready to start!Join in by making your own versions of Bagpuss' presents: a cross-stitch sampler from Emily, a knitted Bagpuss, a lavender Madeleine, and some sugar mice.